"I was trying to find a way to use up some left over marshmallows and my sister told me about making a toast with them." Toast bread in a toaster oven until lightly browned, 1 to 2 minutes. 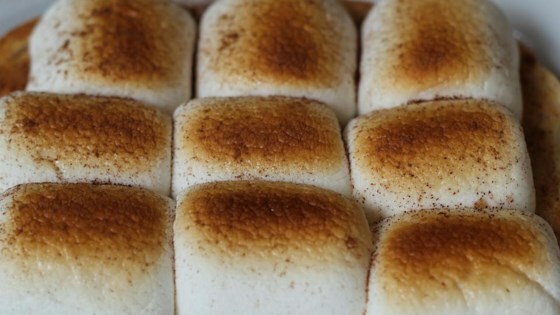 Spread margarine over toast and sprinkle with cinnamon; top with marshmallows. Return toast to toaster oven and toast until marshmallows are golden brown, 1 to 2 minutes. The marshmallows will get burnt fast and easily so once you put the toast back in toaster oven, watch it closely. You can also mix in some cocoa powder with cinnamon or even some instant coffee granules. This is an odd recipe. I can't say it was good or bad since it was really different. My kids thought it had potential and maybe instead of butter spread nutella to make more of a s'more.